Attorney General Loretta Lynch testified before the House Judiciary Committee on Tuesday in a hearing that vacillated between lawmakers expressing concern over the investigation of Hillary Clinton’s email practices and their concerns about recent shootings. House Judiciary Committee Chairman Bob Goodlatte kicked off the hearing with a moment of silence for the law-enforcement victims of last week’s killings in Dallas and the shooting deaths of Alton Sterling in Louisiana and Philando Castile in Minnesota, both by police. Lynch followed with an acknowledgment of her own. The Clinton email probe dominated much of the session, with House Republicans grilling Lynch about her relationship with the Clintons and pressing her on the FBI’s determination in the case. Last week, FBI Director James Comey announced he would not recommend charges against Clinton following his agency’s investigation, but noted that her email use was “extremely careless.” In short order, House Republicans called on Comey to appear at a congressional hearing on the investigation. This morning, Lynch, whose Justice Department closed the Clinton probe last week, was in a similar position. She indicated in her opening statement she wouldn’t be particularly open to discussing the matter. “It would be inappropriate for me to comment further on the underlying facts of the investigation or the legal basis for the team's recommendation.” But Republicans ignored her intention. 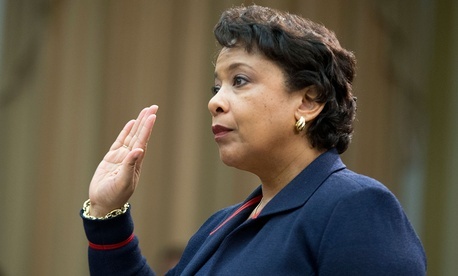 Virginia Representative Randy Forbes asked Lynch whether she was legally prohibited from answering lawmakers’ questions. She said that it “would not be appropriate in my role” to comment on some matters, and noted that Comey’s comments on the case weren’t typical. Goodlatte earlier asked Lynch if she agreed with the FBI’s conclusion. “I accepted that recommendation,” she said. “I saw no reason not to accept it. I reiterate my pride and faith in their work.” She confirmed that she hadn’t spoken with either of the Clintons about the FBI’s investigation, including during a conversation she had just days before Comey’s announcement with former President Bill Clinton. Goodlatte called that encounter “troubling” in his remarks at the top of the meeting.